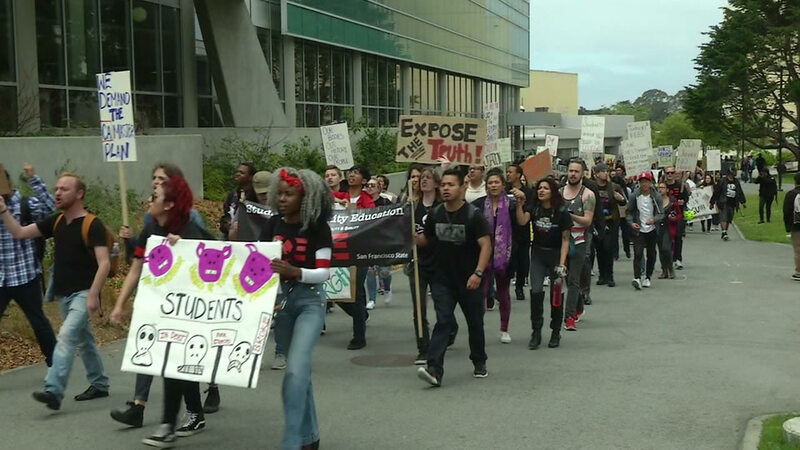 SAN FRANCISCO -- San Francisco State University president Les Wong is meeting today with a group of students and faculty to discuss a dispute over funding to the College of Ethnic Studies that has led to a student hunger strike. A negotiating group has been meeting with university officials since 8 a.m., according to group spokesman Andrew Jolivette, a professor and chair of the American Indian Studies Department. Wong issued a statement Tuesday afternoon stating that he was committed to working through the hunger strikers' demands and urging them to come to the bargaining table "in good faith" and end their hunger strike. "I believe, together, we can come to a resolution that ensures that the College of Ethnic Studies thrives in perpetuity," Wong said in the statement. The group of students began a hunger strike on May 2 in response to what they and faculty members have described as attacks and retaliation on the College of Ethnic Studies. In particular, they allege that the university cut funding for two positions in the Department of Africana Studies and are demanding increased funding for the college. University officials have said that they did not cut funding, but that the department has routinely exceeded its budget for the past several years and the university has been making up the shortfall with one-time funds that are now depleted. One student, Julia Retzlaff, 19, was hospitalized on May 9 after complaining of chest pain earlier in the day but was released within a few hours and has since returned to the hunger strike, Jolivette said. The other participating students have been identified as as Ahkeel Andres Mestayer, 20, Hassani Bell, 18, and Sachiel Rosen, 19.